Herbs: Where Do They Fit in Your Horse’s Diet? The use of herbs as a source of compounds beneficial in promoting good health dates back many (many) thousands of years. In the age before ‘synthetic’ drugs, herbs were the only available source of potentially health-enhancing compounds and as such, they were used extensively. But where do herbs fit in a horse’s diet? With modern day medicine now able to reliably reproduce the specific chemical components of plants that have the desired biological effect, herbs are not so prominent in the treatment or prevention of disease. Herbs are however still enormously popular both in human and equine diets. This newsletter is going to look, in a very broad sense, at how herbs are and perhaps should be used for equines. The true and traditional role of herbs is to provide biologically active ‘medicines’ to treat or prevent disease states. I am the first to confess I know little about the use of herbs as medicine. A true understanding of how to use herbs effectively to treat or prevent certain diseases requires a full understanding of disease pathophysiology and the chemical actions of the herbs themselves. To understand all of this fully would take many years of committed study. Herbs can certainly play a valuable role in the treatment or prevention of disease when used together with conventional or complementary medicine, but to use them effectively, they must be used correctly. Discuss the use of herbs or herbal preparations with your trained herbalist and ALWAYS include your veterinarian in these discussions. Quite a few herbs can have interactions with traditional medicines which if not fully explored can result in negative consequences. For example, ginger has been shown to increase bleeding time, so if it was used in conjunction with other anti-clotting drugs or if your vet was unaware your horse was being supplemented with ginger prior to undertaking surgery there may be complications with excessive bleeding. It is common for people to mistakenly believe that because herbs are natural, they are also completely safe. 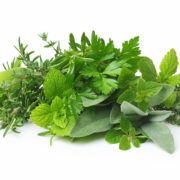 Because herbs contain drug-like components, many of them have the ability to become toxic if fed in too large an amount. Because a horse is such a large animal, the risk is, in reality, probably quite small, but you should always investigate potential toxicity for any herb you are considering to use. Garlic is a good example of a herb that, if fed in too large an amount can have negative consequences, with severe anaemia possible in this case. Some herbs also accumulate high concentrations of certain minerals, with many plants being selenium accumulators and seaweed or kelp a good example of a group of plants that accumulate potentially toxic levels of iodine. Additionally, even though some herbs can have positive effects, like nearly every modern medicine available, many also have the potential to cause negative side effects. Ginger, for example, has been shown to reduce post-exercise recovery time, but it is known to cause gastric ulcers in humans (presumably if it is taken regularly or in large doses) and is theorised to do the same in horses. Many herbal preparations are sold today as ‘complete nutritional supplements’ and yet are sold without any form of typical analysis to support the claim that they are providing a complete range of nutrients that the horse needs in its diet. Herbs are also used singularly to provide vitamins and minerals to a horse’s diet, but in very few cases are herbs actually able to provide enough of any nutrient to have an impact on your horse’s overall nutrient intake. Herbs are just plants, and with the exception of selenium accumulating plants, seaweed which accumulates iodine, and perhaps rosehips as a source of vitamin C, herbs really aren’t capable of providing significant amounts of vitamins or minerals in a diet. Enter any herb we have in the FeedXL database to your diet and you will see that even in large doses they have little to no useful impact on the nutrient content of a diet. That is not to say all herbal preparations are not worthwhile. Some well trained herbalists with a good understanding of nutrition have nutritional supplements that contain herbs together with more conventional sources of nutrients to give you supplements that do contain useful levels of vitamins and minerals together with complementary support from the herbs. 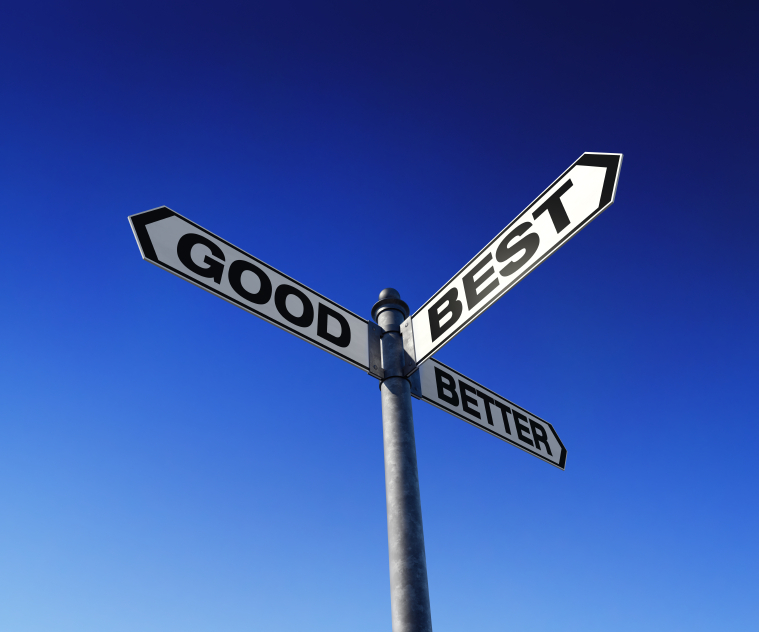 If you are buying herbal supplements that are being sold as nutritional supplements ALWAYS request a typical analysis. If one is not available, you should question how the supplier knows it is a nutritional supplement if they can’t even tell you what nutrients it contains. Don’t spend your hard-earned money on supplements that promise a lot without any sort of evidence to back it up. As always, a balanced diet should underpin your horse’s entire health regime. While the use of herbs can certainly help support and promote good health or assist in the treatment of disease, if you are feeding herbs on top of diets that contain deficiencies of critical vitamins or minerals their effectiveness will be severely limited. Using FeedXL to first balance your horse’s diet, then working with your trained herbalist to devise a herbal strategy specifically for your horse will give you the best results. Use herbs only from trusted suppliers that can guarantee the consistent quality of the herbs. Always discuss the use of herbs with your vet, particularly if your vet is also prescribing modern medicines for the treatment of a particular condition. Understand the herbs you are using, particularly their potential toxicities so that you can use them to good effect without having them cause their own problems. Don’t forget that very few herbs contain nutrients in high enough concentration to contribute substantially to any horse’s diet. 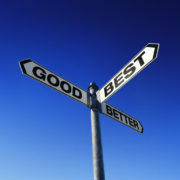 If you are buying herbs as nutritional supplements always request a typical analysis for the product. If you are using herbs like seaweed to provide a particular nutrient, always use FeedXL to calculate accurate dose rates to avoid overfeeding and creation of nutrient toxicity. This newsletter by Dr. Nerida Richards was originally posted to the FeedXL user forums for FeedXL subscribers in January 2013. If you would like to be among the first to receive our newsletters then please consider becoming a FeedXL member or subscribing to our email list. https://feedxl.com/wp-content/uploads/2013/01/AdobeStock_115286823-e1511594729393.jpeg 658 1000 Dr Nerida Richards https://feedxl.com/wp-content/uploads/2017/08/FeedXL-header-logo-300W.png Dr Nerida Richards2013-01-06 11:32:222019-03-02 06:30:16Herbs: Where Do They Fit in Your Horse's Diet? Garlic for Horses: Should You Feed It? Herbs have been used in some cultures as remedies for disease and illness for more than 5000 years and their effectiveness as part of an ‘integrated system of primary health care’ is well recognised. Given the benefits we see in humans, it is becoming more and more commonplace to use herbs like garlic for horses. However, in many cases for horses, herbs are used not as part of a holistic approach to health care, but rather as a nutritional supplement. 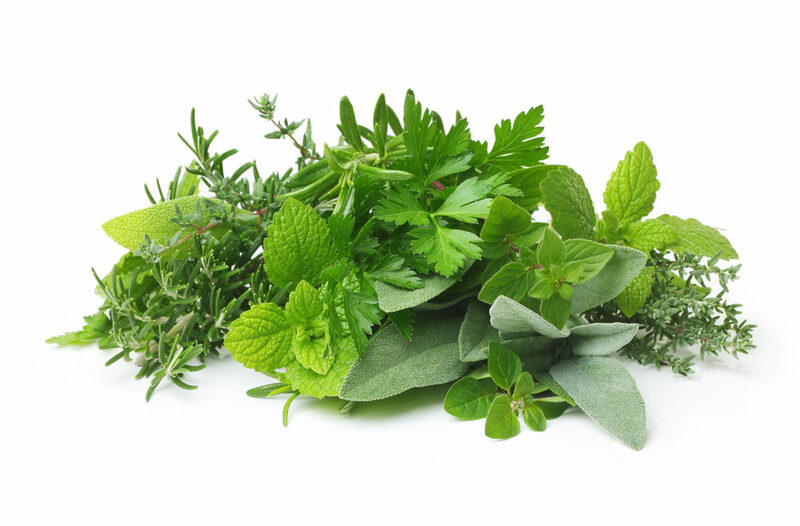 Herbs are commonly added to diets as sources of copper, sulphur, zinc, selenium and iodine. The problem is, most herbs actually contain very little of these nutrients (with the exception of iodine in seaweed). So to supply any real amounts of nutrients, these ingredients need to be fed at high levels … The problem is, some herbal products like garlic can be toxic for horses, especially if you feed them at high rates. So, if you are considering feeding garlic to your horse, you first need to consider the potential benefit to be gained versus the risks involved. Why is garlic even considered as a feed ingredient? The answer to this question is likely because we as humans have used it with good effect in our own diets for thousands of years. Traditionally in human medicine, garlic is used as an anti-microbial agent. A compound called allicin, present in garlic, is known to have an anti-microbial effect which (along with some other compounds) is thought to give garlic this property. Garlic also has a well liked taste and smell and is used to give food flavour. As humans, we all too often fall into the trap of thinking what is good for us must be good for our animals. But take chocolate, macadamia nuts, garlic and onions as an example. All of these foods are eaten extensively by humans and all (yes, even chocolate) have health benefits when eaten in moderation – yet every one of these foods is poisonous to dogs, highlighting that just because we can eat it and receive health benefits, it doesn’t mean that our companions, including our horses can. We really don’t know the answer to this question. There is also a question over whether it kills off beneficial bacteria in the horse’s gut, which the horse relies on to digest fibre. I guess the real question is WHY do we want to feed a horse an anti-microbial agent all the time? It would make more sense to only feed one when the horse is at risk of microbial infection. We would never consider giving antibiotics all the time, so why is garlic any different. Perhaps the perception that it is ‘natural’ makes us feel more inclined to use it all the time rather than just when it may be needed. Sometimes it is fed all the time in a horse’s diet not as an anti-microbial, but as a nutrition supplement, raising the question of whether it is useful for this purpose. Does garlic provide a horse with beneficial nutrients? As you can see from the table above, garlic provides less than 2% of a horse’s daily requirement for these minerals and as such is virtually useless as a ‘mineral supplement’.Try this in your own horse’s diet in FeedXL, enter 100 grams of garlic in the diet and look at the graph to see what it contributes to the diet; its nutritional effect is virtually nil. Is garlic safe for horses? There is much debate over whether or not garlic is safe to feed horses. A study conducted by Wendy Pearson at the University of Guelph, Canada in 2005 found that when fed at high levels (250 g/day for a 500 kg horse) garlic caused an array of changes in the horse’s blood including an increase in mean corpuscular volume (MCV), decreases in red blood cell count and blood haemoglobin concentration. These changes eventually led to a condition known as Heinz Body Anaemia. While the dose rate they used was high, the researchers note that currently a safe dose rate for horses is unknown. Because research has not been carried out looking at feeding lower doses of garlic over a long period of time we don’t know ‘scientifically’ if it is safe or not. Onion, a close relative of garlic and containing the same toxic component (n-propyl disulfide) is also known to be toxic to horses, with research conducted in 1972 showing that consumption of onion tops caused severe anaemia. Again, this study used large amounts of onion tops to produce life threatening anaemia within 11 days, meaning the question of whether onions and garlic would be safer at lower levels still remains. However, US veterinarian Dr Karen Hayes notes in her article “Feeding Garlic – The great garlic debate” that she sees a handful of cases of Heinz Bodied Anaemia every year resulting from horses consuming wild onions in amongst their pasture or in horses who have raided a compost or garden and eaten garlic or onions, suggesting perhaps that the dose doesn’t need to be high for effects to occur. In any case, the effects the researchers have observed when feeding garlic or onions at high levels have been severe. While feeding garlic at lower levels over long periods of time may not cause a life-threatening anaemia, it may be causing anaemia that is mild enough not to be overtly noticed, but prevalent enough to reduce your horse’s stamina and performance and Dr Hayes suggests it may even affect a horse’s ability to resist disease. If you do feed garlic and wish to continue feeding it, it would be a good idea to run a blood analysis on your horse to make sure their mean corpuscular volume, haemoglobin and packed cell volume levels are in the normal range and that no Heinz Bodies are present. So should you feed it or not? My normal stand on feeding garlic to horses is unless there are DEFINITE and DEMONSTRATABLE benefits associated with feeding garlic to your specific horse, don’t feed it. While it is true that it hasn’t been proven that lower dose rates of garlic will harm your horse, it also hasn’t been proven that feeding garlic to your horse provides any specific benefits. We also don’t know what garlic does to horses when fed consistently at low feeding rates. Next time you go to tip garlic into your horses feed just take a moment to consider why you are feeding it, what benefit the horse is getting and whether it is worth taking the potential risk, even if it is only a small one. There is no doubt herbs can make valuable nutraceutical additions to diets but if you are considering using them as nutritional supplements, use FeedXL to see what it is they are actually adding to the diet. This newsletter by Dr. Nerida Richards was originally posted to the FeedXL user forums for FeedXL subscribers in December, 2010. If you would like to be among the first to receive our newsletters then please consider becoming a FeedXL member or subscribing to our email list. https://feedxl.com/wp-content/uploads/2012/03/icon-26.jpg 54 80 Dr Nerida Richards https://feedxl.com/wp-content/uploads/2017/08/FeedXL-header-logo-300W.png Dr Nerida Richards2012-03-01 11:00:092019-03-02 06:30:48Garlic for Horses: Should You Feed It? Flaxseed (also known as linseed) is a valued feed ingredient amongst horse people. How it should be used has long been the subject of considerable debate. Its safety for horses has always been under question and methods of preparation are many and varied. This FeedXL newsletter looks at what flaxseed can add to your horse’s diet, if it is safe to feed and how it can be prepared for feeding. What does flax add to a diet? Flaxseed’s best known attribute is its high Omega 3 essential fatty acid content. Flaxseeds are over 40% oil and more than 50% of this oil is the omega 3 fatty acid α‐linolenic acid. A horse’s natural grazing diet is high in omega 3 fatty acids. However as we add grains like corn and barley to a horse’s diet their diet can become skewed towards having high levels of omega 6 fatty acids. Flaxseed provides a ‘natural’ way to keep the levels of omega 3 in a horse’s diet balanced without using expensive omega 3 fatty acid supplements. Adding 100 grams of flaxseed to your horse’s diet will add over 20 ml of omega 3 fatty acids. While omega 3 fatty acids are generally the primary reason flaxseeds are fed to a horse, flaxseeds are a decent source of protein with around 24% protein and 0.9% lysine and also contain around 25% fibre. 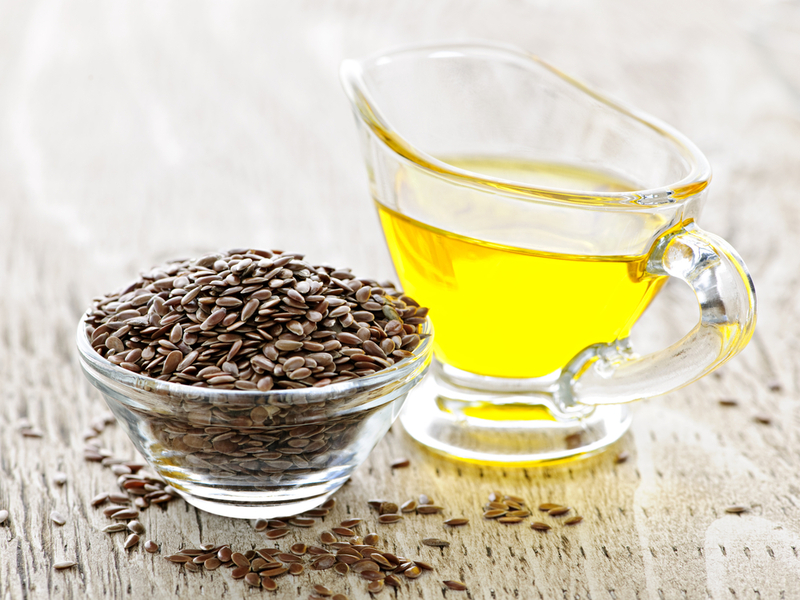 When can flaxseed be used? Flaxseed is useful for horses on a high grain (and therefore high omega 6 fatty acid) diet or when they are eating hay that has been in storage for some time or grazing low quality pasture. Flaxseed may also be used when horses have a dry coat and skin, if they have problems with inflammation including arthritis and sweet itch/Queensland itch or when high omega 6 oils like corn oil or sunflower oil are being fed as an energy source in the diet. Flaxseed itself can be used as a source of energy in the diet and because of its high fat attribute is often found in supplements intended to promote weight gain in horses. How should flaxseed be prepared for feeding? Because flaxseed is such a small seed it is best to grind flaxseeds immediately prior to feeding to break the seed coat, otherwise the seeds will pass undigested all the way through the gastrointestinal tract. It is important to grind the seeds fresh just prior to feeding as the oils in flaxseed are prone to rancidity and will go off very quickly if ground and left exposed to air. A small coffee grinder is commonly used for the purpose of grinding fresh flax straight into a horse’s feed (very gourmet!). It is possible to purchase pre‐ground and stabilised flaxseeds if grinding your own is not an option. Does Flaxseed have to be boiled before feeding? Tradition says that flaxseed must be boiled before feeding it to a horse because of the risk of Prussic Acid (or hydrogen cyanide) poisoning. Anyone who has boiled flaxseed knows how messy it gets and for most the effort and mess are too much to continue persisting. Well good news … flaxseed it seems can be fed safely without being boiled. Flaxseed contains compounds called cyanogenic glycosides. When the flaxseeds are chewed up by a horse these cyanogenic glycosides come into contact with an enzyme (β‐glycosidase) which converts it to hydrogen cyanide, which can then lead to cyanide poisoning. HOWEVER, the β‐glycosidase enzyme is destroyed by the acidic environment of the horse’s gastric stomach, meaning the cyanide is never produced in quantities large enough to cause any problems. This means you can feed flaxseed without cooking it first. A study published in the Canadian Journal of Veterinary Research in 2002 looking at the ability of flaxseed to reduce the inflammation associated with culicoides hypersensitivity (sweet itch or Queensland itch) reported that they fed 1 lb of flaxseed per 1000 lb of bodyweight to horses (or 0.5 kg per 500 kg bodyweight) over a period of 42 days with no negative side‐effects being observed. With this dose rate being much higher than the normal 1 to 2 cups fed per day it can be concluded that flaxseed is safe to feed to horses without cooking it first. It is possible that soaking flaxseed may actually make it dangerous as soaking the seeds would, to some extent, allow the β‐glycosidase enzyme to come into contact with the cyanogenic glycosides and allow for the production of hydrogen cyanide. So it is recommended you do not soak flaxseed before feeding. Can flaxseed meal be fed? Flaxseed meal is the high protein (32%) meal left over after the flaxseed oil has been extracted from the seed. Flaxseed meal can be fed to horses, however because the meal has had most of the oil extracted its primary use in a horse’s diet is as a protein supplement. The risk of cyanide poisoning from flaxseed meal is a little unclear. Because the seed is crushed during the oil extraction process it is possible for the β‐ glycosidase enzyme to come into contact with the cyanogenic glycosides, so it is likely hydrogen cyanide will be present. If you wish to feed flaxseed meal, look for meal produced using heat extraction technology as opposed to meal made from seeds that were cold pressed. There are however far better sources of quality protein available including lupins, full fat soybean, soybean meal and canola meal, without the possible risk associated with flaxseed meal. Flaxseed contains phytoestrogens. Phytoestrogens are naturally occurring plant compounds that are structurally similar to estrogen. Studies in rats (Collins et al 2003) have found that feeding high levels of flaxseed to rats increased the number of female rats with irregular estrous cycles, suggesting flax could have a negative impact on the fertility of breeding animals. If you are breeding your mares and having any type of fertility problems it would be wise to avoid flaxseed in their diets. Flaxseed is a useful feed ingredient for horses. It can be used to increase a horse’s omega 3 essential fatty acid intake where dietary omega 3 levels are low or when higher intakes of omega 3 for a particular horse seem beneficial. Despite popular opinion that flaxseed must be cooked prior to feeding to avoid hydrogen cyanide poisoning, studies have shown that up to 1 lb/1000 lb bodyweight (or 0.5 kg/500 kg BW) can be safely fed without cooking. Flaxseed should not be soaked prior to feeding and they should be avoided in the diets of breeding mares with a history of reproduction problems. FeedXL can be used to incorporate flaxseed into your horse’s diet so that it balances well with other feed ingredients being fed. Flaxseed flowers picture © Joe Gough – Fotolia.com, pile of flaxseeds picture © Goran Bogicevic – Fotolia.com. This newsletter by Dr. Nerida Richards was originally posted to the FeedXL user forums for FeedXL subscribers in August, 2010. If you would like to be among the first to receive our newsletters then please consider becoming a FeedXL member or subscribing to our email list. Seaweed for Horses: Miracle Supplement or Massive Con? There has been much debate about the potential benefits to be gained from feeding seaweed to horses. 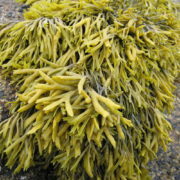 On one side, we have seaweed being reported as a multifunctional supplement that will act as an anthelmintic, antacid, immuno-stimulator, anti-inflammatory, anti-cancer, anti-bacterial, anti-ulcer, heavy metal scavenger, fertility enhancer, nerve calmer, thyroid stimulator and skin and coat conditioner. From the other side, seaweed is called nothing more than a con, containing potentially dangerous levels of iodine and precious little of anything else. So who is right, and is there any middle ground to be sought in this argument? Seaweed is a marine plant that can be found in oceans all around the world. There are approximately 1700 different varieties of seaweed and they come in three different colours; green, brown and red. 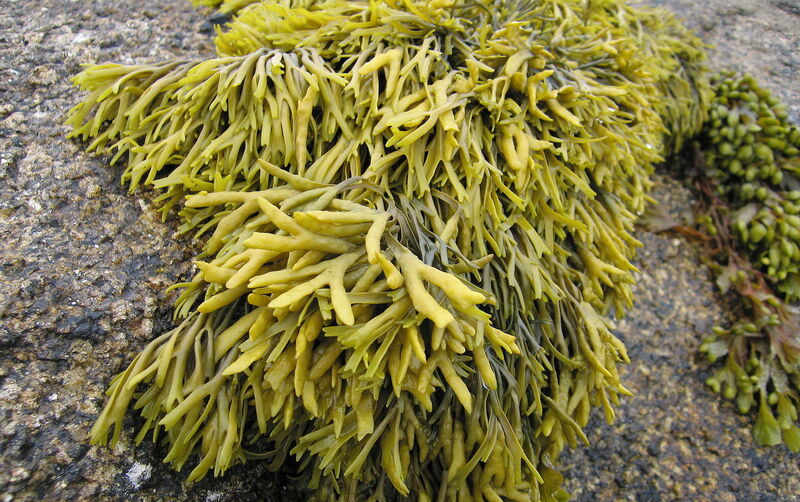 The green seaweeds generally grow close to the water’s surface and are smaller than the brown and red varieties. Brown seaweed grows in slightly deeper and often cold waters, while the red seaweeds grow in very deep waters. It is the brown seaweed (also called Kelp) that is commonly fed to horses in Australia. Generally people will add seaweed to their horse’s feed to supply trace minerals that are lacking in the pasture, hay and concentrates being fed to the horse. Effectively, seaweed is used as a trace mineral supplement. Is Seaweed a Good Trace Mineral Supplement? Seaweed supporters will readily tell you that seaweed contains ‘every nutrient needed by the horse’ including 48 minerals, 16 amino acids and 11 vitamins, making it sound like a very attractive and natural option for trace mineral supplementation. However, the concentration of minerals in seaweed is so low that when fed at the levels generally recommended for horses (15 to 30 grams/day) it makes virtually no contribution to satisfying a horse’s trace mineral requirements, with the exception of iodine (Table 1). Table 1: The percent of daily nutrient requirements for a 500 kg horse in light work satisfied by 20 grams of seaweed containing 600 mg/kg of iodine or by 20 grams of a well formulated commercial trace mineral supplement. When it comes down to it, seaweed gives your horse very little benefit from a trace mineral perspective (with the exception of iodine, which is grossly oversupplied), particularly when considered in comparison with a well formulated commercial supplement. How Much Iodine Does Seaweed Contain? The iodine concentration of seaweed is generally highly variable and depends on many factors including the variety of seaweed and the age of the blades that were harvested and analysed. In a study conducted in 2004 (Teas et al.) researchers found that the concentration of iodine in 12 different seaweeds varied from 16 mg/kg to 8165 mg/kg. They also found that within the same variety of seaweed, iodine concentration ranged from 514 mg/kg of iodine in the older sun‐bleached blades to 6571 mg/kg in the juvenile, fresh blades, demonstrating the highly variable concentrations of iodine that may be present in a seaweed product. How Much Iodine Do Horses Need? Horses require between 0.35 and 0.4 mg of iodine/kg of dry matter consumed per day. Thus a 500 kg horse consuming 2% of its body weight in feed per day will need between 3.5 and 4 mg of iodine per day. Iodine toxicity will occur at intakes of 5 mg/kg of dry matter consumed per day, which is equal to approximately 50 mg/day for a 500 kg horse. Can Seaweed Cause Iodine Toxicity? YES! Iodine toxicities can definitely occur when horses are fed too much seaweed. So, how much seaweed is too much? Well, that all depends on the concentration of iodine in the seaweed. Eighty grams of seaweed that contains 600 mg/kg of iodine will need to be fed to cause acute iodine toxicity in a 500 kg horse, while just 6 grams of seaweed containing 8000 mg of iodine/kg will cause acute toxicity in the same horse. Chronic toxicity may also be a problem in horses. The effects of feeding relatively high concentrations of iodine to a horse over a long period of time (for example you may feed 20 grams per day of a 600 mg/kg iodine seaweed for 6 months, providing your horse that has a requirement of 2 mg of iodine/day with 12 mg of iodine per day) have never been studied in horses. Studies in humans however (Pearce et al. 2002; Mizukami et al. 1993) have shown that iodine toxicity can be precipitated through long term exposure to moderately high concentrations of dietary iodine. Thus the answer to the question ‘how much is too much?’ is ‘we don’t know’, meaning seaweed must be fed with extreme caution, if it is to be fed at all. Is There Any Time That Seaweed Is Useful in a Horse’s Diet? Given the high iodine concentration in seaweed, it can be useful to feed as an iodine supplement when there is a demonstrated iodine deficiency. Remember that an iodine deficiency will cause virtually exactly the same symptoms as an iodine toxicity (goitre, a dry, lustreless coat, lethargy, dullness, drowsiness and timidity, inappetence and cold intolerance). Thus the only way to diagnose and differentiate an iodine deficiency from toxicity is to carefully analyse the iodine content of the feeds your horse is eating. If an iodine deficiency is diagnosed and you decide to feed seaweed, carefully calculate the amount required by your horse using the iodine concentration specified on the particular product you are using. Do not overfeed seaweed in an attempt to rapidly correct your horse’s iodine deficiency as you will end up correcting the deficiency only to cause a damaging toxicity. Consider exactly why you want to feed seaweed. If you can’t pinpoint a good reason such as a demonstrated iodine deficiency, then it is probably best you don’t feed seaweed at all. Obtain the iodine content of the seaweed product you wish to use. If the product you are considering does not specify its iodine content do not feed it. Never feed your horse anything unless you know what is in it. If you have your seaweed tested for iodine concentration, send us the analysis at FeedXL and we can put your specific analysis with the tested iodine level into your personal FeedXL database. Using the products specified iodine concentration, calculate how much you need to feed per day to satisfy but not substantially exceed your horse’s iodine requirements. When using FeedXL, this is easy. Simply put enough seaweed meal into your horse’s diet to meet the calculated iodine requirement. No pen and calculator required. FeedXL will also make sure that if your horse is being fed other iodine containing supplements these are taken into account. Carefully weigh and feed the calculated amount of seaweed to your horse each day. Never give your horse free access to seaweed; this will just be an iodine toxicity waiting to happen. There is a particular risk in feeding seaweed to pregnant and lactating mares. Excess dietary iodine accumulates in the placenta and is excreted in milk. Thus foals born to mares consuming diets high in iodine will be at risk of developing iodine toxicity. Foals from these mares may be born dead, or very weak, with a poor suckle response. Those who live and continue to suckle from their dam will likely develop skeletal abnormalities as iodine toxicity causes low serum thyroxine hormone concentrations and the thyroxine hormone is crucial for cartilage maturation and bone formation. Think carefully about feeding seaweed to your horse. If your horse doesn’t need additional iodine in its diet then I would suggest you don’t feed seaweed. If you do decide to feed it, do so with extreme caution, ensuring that you always use FeedXL to calculate the amount to feed and weigh and feed that amount accurately. Don’t guess, it’s definitely not good for your horse’s health! https://feedxl.com/wp-content/uploads/2011/01/seaweed.jpg 1000 1593 Dr Nerida Richards https://feedxl.com/wp-content/uploads/2017/08/FeedXL-header-logo-300W.png Dr Nerida Richards2011-01-26 11:42:362019-03-02 06:31:25Seaweed for Horses: Miracle Supplement or Massive Con? The question is, which form of grain is best for your horse, cooked or uncooked? 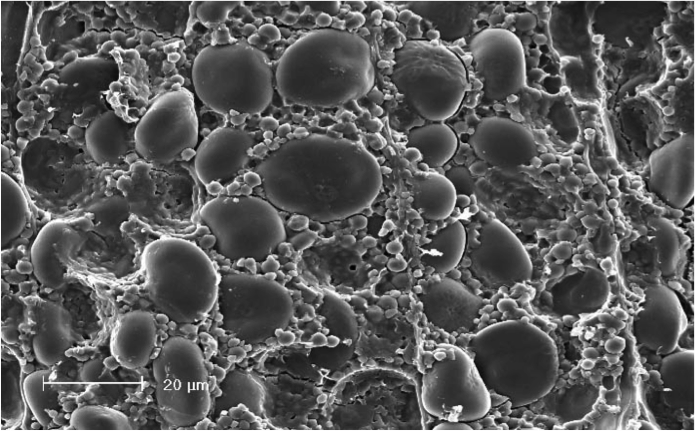 The starch granules, embedded in the protein, are then encased within individual endosperm cells and protected by a cell wall. 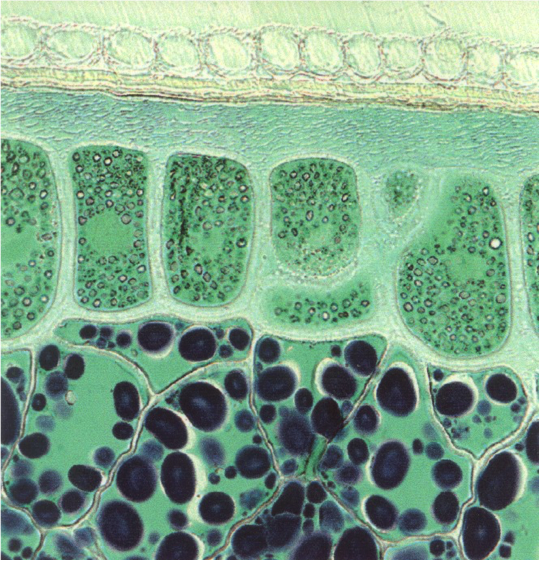 Many of these cells are packed tightly within the grains starchy endosperm (the white bit found in the middle of a grain). And the endosperm itself is protected by the aleurone layer and finally the entire structure is covered by the seed coat (Figure 2). Now from the plant’s perspective, all of this packaging is absolutely critical for its survival and is designed to protect the plant embryo and its stored sources of energy and protein to ensure it will be able to grow and survive for the first few days following germination. This newsletter by Dr. Nerida Richards was originally posted to the FeedXL user forums for FeedXL subscribers in April, 2010. If you would like to be among the first to receive our newsletters then please consider becoming a FeedXL member or subscribing to our email list. https://feedxl.com/wp-content/uploads/2010/10/iStock-537266236.jpg 2576 3865 Dr Nerida Richards https://feedxl.com/wp-content/uploads/2017/08/FeedXL-header-logo-300W.png Dr Nerida Richards2010-10-26 11:34:192019-03-02 06:31:31Grains for Horses: Cooked or Uncooked? Known as lucerne in the UK, Australia and New Zealand, alfalfa hay enjoys a varied reputation amongst horse people, with some using it as a highly valued component of their horse’s diet and others avoiding it with almost religious fervour. So, who is right? Is alfalfa hay a suitable forage for horses? Or are there other more suitable forages? The answer is yes, and yes. Alfalfa hay is a valuable forage for horses when fed to the right classes of horses and in the correct amounts for its full benefit to be realised. The following article looks at the nutrients contained in alfalfa hay and its many and varied uses in the horse industry. 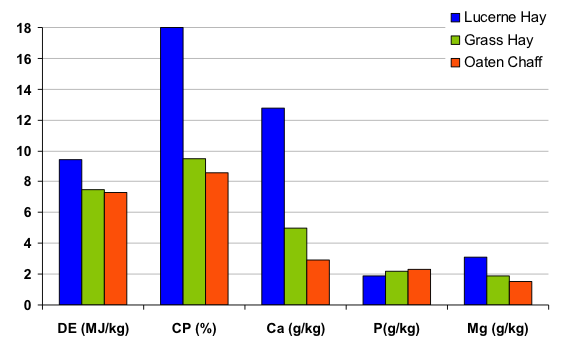 Figure 1: A comparison of the digestible energy (DE), crude protein (CP), calcium (Ca), phosphorous (P) and magnesium content of early bloom lucerne hay, grass hay and oaten chaff. Good quality alfalfa hay contains more protein and energy than grass or cereal hays and chaffs (Figure 1). Alfalfa also contains high concentrations of calcium and magnesium, and when fresh, the vitamins A and E. Alfalfa is typically low in phosphorous and depending on where it was grown, contains varying concentrations of other micro and macro minerals. The protein in alfalfa hay is of high quality and contains appreciable amounts of the essential amino acid lysine. Alfalfa hay can be used to provide energy, good quality protein and a source of fibre to the diet of a performance horse; however, it must be used in moderation. Excess protein in the diet of working horses and particularly those that are stabled can be detrimental to their health and performance. Excess protein intake will increase urinary ammonia production, which may then result in respiratory problems for horses confined to a stable. Excess protein can also contribute to dehydration due to water loss through increased urine production and excretion and increases the amount of heat produced during the digestion and utilisation of feedstuffs. Therefore a diet containing protein in excess of the horse’s requirement can increase the horse’s water and electrolyte loss through sweating and can contribute to hyperthermia, and decreased performance or endurance capacity. It is important to understand that these effects are not as a direct result of feeding alfalfa, but rather from feeding too much alfalfa. Avoid them by keeping protein within the RDI limits. Use a grass or cereal hay to supply some of the horse’s roughage/fibre requirement. Alfalfa hay can play a role in the spelling or idle horse’s diet, and will provide these horses with good quality protein and calcium. If you keep energy and protein within your horse’s RDI, you can safely feed alfalfa without having excess weight gain due primarily to too much energy. Ponies may be safely fed alfalfa hay, but again it must be fed in moderation. Alfalfa hay, because of its highly digestible nature is capable of encouraging significant weight gain in ponies, particularly those that are easy keepers. Feeding too much alfalfa hay may therefore predisposeponies to laminitis, as the risk of laminitis increases when ponies become overweight (again, this is not as a result of feeding alfalfa, but as a result of feeding too much energy and protein which in turn leads to excess weight gain). Keep energy and protein within the recommended daily limits when using alfalfa in the diets of ponies. Alfalfa hay is very useful in the diet of aged ponies. As horses and ponies age, they lose some ability to digest fibre and protein. Feeding them an easily digested fibre and high quality protein source in the form of alfalfa hay will help them maintain bodyweight, particularly in winter. Alfalfa hay may not be suitable for horses suffering with hyperkalaemic periodic paralysis (HYPP) as its concentration of potassium is often quite high (14 – 25+ g/kg). Make sure you keep potassium in particular at the 100% RDI in these horses, regardless of the feeds you use. In the reverse, and contrary to popular opinion, alfalfa hay is a very suitable feedstuff for horses that have suffered a bout of laminitis. The high quality protein in alfalfa hay will help the horse to repair its damaged laminae while the energy derived from the alfalfa will prevent these horses from entering a negative energy balance which slows or prevents the hoof’s healing process taking place. In comparison to some grass hays, alfalfa also contains a lower level of starches and sugars. Again, make sure you feed alfalfa hay in moderation to prevent excess weight gain; don’t exceed the energy and protein RDI’s in FeedXL. Alfalfa is a valuable forage in the diet of growing horses. Alfalfa provides growing horses with a digestible source of energy as well as a source of high quality protein and the essential amino acid lysine. Alfalfa’s calcium rich characteristic is also beneficial for growing horses that typically have high calcium requirements. However, when feeding alfalfa to growing horses, the amount fed should not exceed the growing horse’s energy requirements. Growing horses fed energy in excess of their RDI’s have a much higher chance of suffering from developmental orthopaedic diseases including osteochondritis dissecans (OCD). 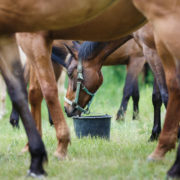 Feeding protein in excess of the growing horse’s protein requirements does not appear to be detrimental as the protein can be utilised as a source of energy. However, protein is an expensive source of energy and to quote Susan Garlinghouse “it is sort of like using bundles of dollar bills to start a barbeque. It’ll get the job done, but there are much cheaper, easier and more efficient ways of doing it”. Therefore, instead of using alfalfa hay to meet 100% of a growing horse’s energy requirements (which will far exceed their protein requirements) it would (depending on pasture conditions) be more economical to use some form of cereal grain or high energy fibre like sugarbeet pulp or soybean hulls to provide additional energy in the diet when needed. Another point to be aware of when feeding alfalfa hay to growing horses is their intake of phosphorous. 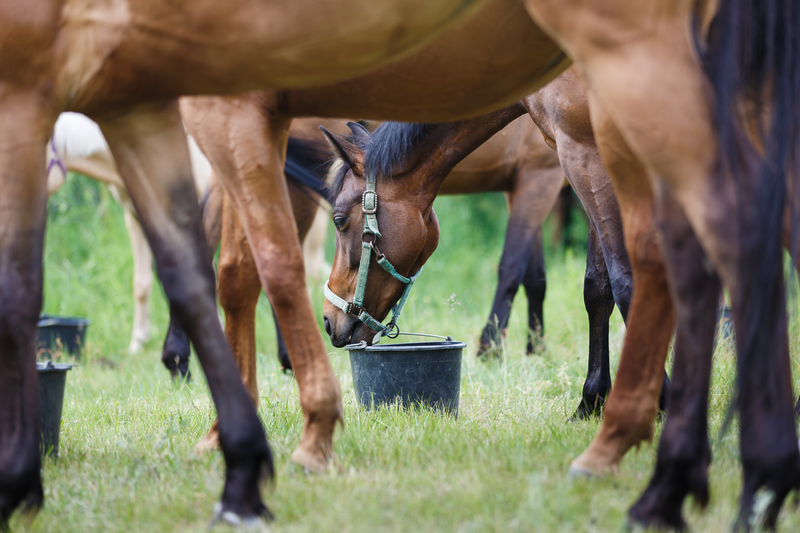 While feeding alfalfa hay to meet a growing horse’s protein requirements will also in most cases meet their calcium requirements, their phosphorous requirements will not be met. Feeding cereal grains will help to increase a growing horse’s intake of phosphorous, however, in many cases, phosphorous supplementation may be required (remembering that the calcium to phosphorous ratio in the diet of a growing horse should be maintained within the range of 1: 1 to 3: 1). Dicalcium phosphate is a suitable source of phosphorous for growing horses. Also keep in mind that alfalfa hay is not a complete feed and will more often than not contain insufficient concentrations of trace minerals, in particular copper and zinc, to support sound musculoskeletal development. Thus diets utilising alfalfa hay as a protein and energy source must be balanced using an appropriate trace mineral supplement for the best results. Once again, getting the diet balanced for the nutrient RDI’s in FeedXL is vital to making the best use of alfalfa. Alfalfa hay is an exceptional source of energy and good quality protein for pregnant and lactating mares. Alfalfa hay will also help to support these mares’ elevated requirements for calcium and the essential amino acid lysine. When feeding the pregnant mare alfalfa hay, take care not to exceed her energy requirements since this can cause her to become overweight. Pregnant mares should remain within a body condition score of 5 to 7 (using the Henneke scale of condition scoring) to prevent reduced milk production during the lactation period. The lactatating mare’s energy requirements however are higher, and alfalfa hay alone will not be capable of meeting these and may, depending on pasture conditions, need to be fed in conjunction with cereal grains or high energy fibres to maintain body condition throughout lactation. Likewise, the lactating mare’s phosphorous and trace mineral requirements will not be met by a diet of alfalfa hay, thus these must also be supplemented accordingly. As with growing horses, excess protein in the diet of pregnant and lactating mares does not appear to be harmful, however it is an unnecessary waste of this relatively expensive feed component and should be avoided if possible. Alfalfa is a valuable feedstuff for horses and is capable of providing them with energy, high quality protein, lysine, calcium and varying levels of other vitamins and minerals. However, alfalfa hay must be used correctly in the diets of all horses to realise its full benefits. Problems with the feeding of excess energy and protein are possible when feeding alfalfa hay so keep a close watch on those energy and protein RDI’s. Use grass/meadow hays in conjunction with alfalfa hay to fulfil a horse’s roughage requirement and well chosen supplements to fulfil mineral requirements. This will help you balance the diet and avoid some of the problems that can be associated with over‐feeding alfalfa hay. This newsletter by Dr. Nerida Richards was originally posted to the FeedXL user forums for FeedXL subscribers in August, 2009. If you would like to be among the first to receive our newsletters then please consider becoming a FeedXL member or subscribing to our email list. https://feedxl.com/wp-content/uploads/2014/01/iStock_000012676792Small.jpg 632 759 Dr Nerida Richards https://feedxl.com/wp-content/uploads/2017/08/FeedXL-header-logo-300W.png Dr Nerida Richards2009-12-12 13:51:272019-03-02 06:31:49Alfalfa (Lucerne) Hay: Friend or Foe?